As reported by The Hollywood Reporter, horror maestros Wes Craven and Steve Niles are joining forces to adapt Black Mask's upcoming comic book THE DISCIPLES into a TV show for Universal Cable Productions with Niles' Black Mask co-founders Matt Pizzolo and Brett Gurewitz executive producing alongside Industry Entertainment's Sara Bottfeld. THE DISCIPLES marks Black Mask's latest foray into TV, joining the adaptation of FIVE GHOSTS that Black Mask has in development at Syfy with Evan Daugherty (Snow White And The Huntsman) writing the pilot. 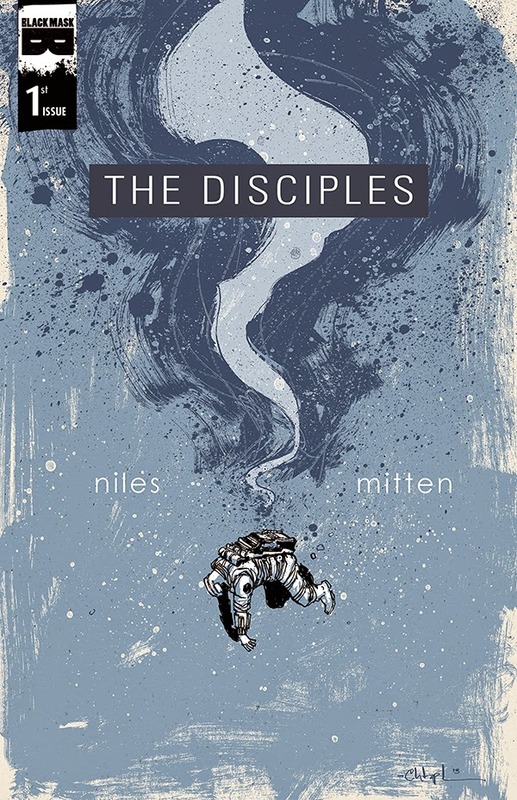 THE DISCIPLES is a sci-fi/horror story about a team of interstellar private eyes tracking down a girl who's run off to join a cult on Jupiter's moon Ganymede... it's 'True Detective in space' brought to you courtesy of Steve Niles (30 DAYS OF NIGHT) and Christopher Mitten (UMBRAL). Niles co-founded Black Mask Studios with Pizzolo and Gurewitz in 2013 as a home for edgy and subversive comics. At the time, Niles described the company's mission:"If V For Vendetta were created today, there would be no publisher for it... we want to be that publisher." Niles and Pizzolo wanted to be sure the company established itself as a champion of bold creators rather than an outfit for distributing their own works, so they held back on participating in the creative side until after the company had established itself with its four initial releases: the political anthology OCCUPY COMICS, Darick Robertson's transreal cyberpunk adventure BALLISTIC, Ghostface Killah's TWELVE REASONS TO DIE, and animal-avenging vigilantes tale LIBERATOR. When the second slate was announced, Niles' THE DISCIPLES and Pizzolo's YOUNG TERRORISTS joined the dramatically expanded roster including Grant Morrison and Vanesa Del Rey's SINATORO. Designed to find new ways of supporting creators, Black Mask has consistently sought innovative, fresh ways to reach new audiences and help them discover smart creator-owned comics -- the most recent example being the YouTube 'tubecomics' initiative reported on by The NY Times. Dagmar, Rick, and Jules, intrepid private eyes/bounty hunters, have been hired by a high ranking Senator to retrieve his teenage daughter who's run off to join a mysterious religious cult. This is no ordinary cult though. In the near future of "The Disciples," the ultra-wealthy have become true Masters Of The Universe by colonizing moons throughout the solar system. Billionaire industrialist McCauley Richmond is one such colonist: he's built a new society on Ganymede, a moon of Jupiter, where his flock of cultists can have the religious freedom to worship him. This ghost story in space reunites comics’ king of the macabre Steve Niles with his longtime collaborator Christopher Mitten, whose stylish mix of grit and flow matches Steve’s sharp characterizations and taste for screams.